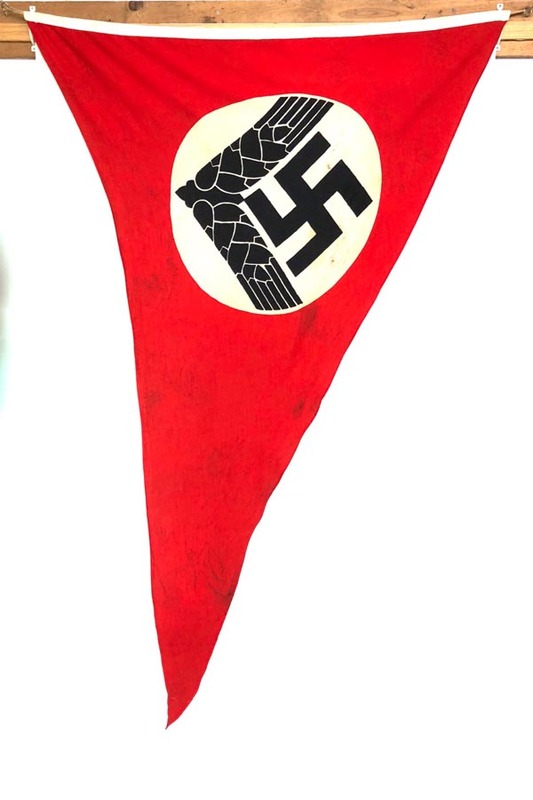 PHYSICAL DESCRIPTION: This German Female RADwJ Pennant is in nice condition showing some soiling. 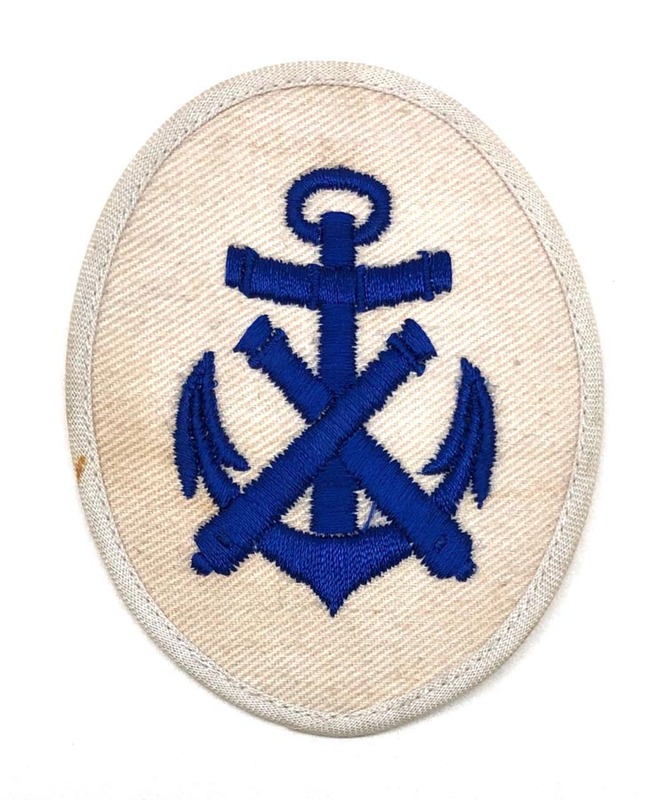 Tip of pennant has some reinforcement stitches. 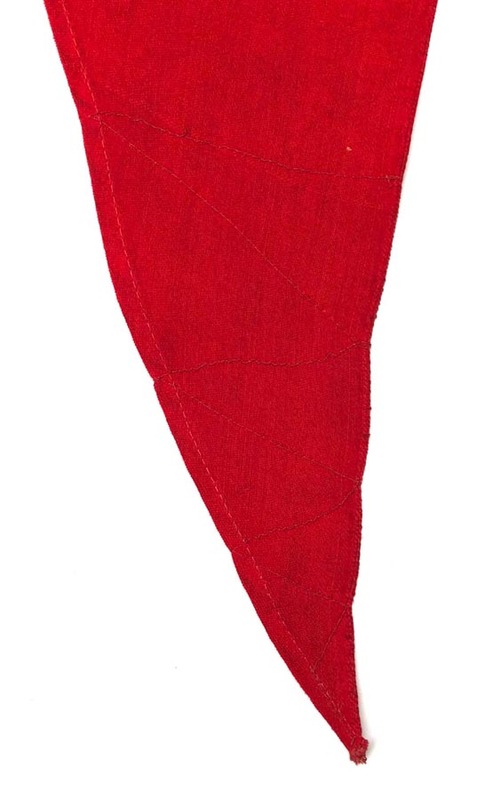 Pennant is double side printed and measures approximately 51 inches by 83 inches. 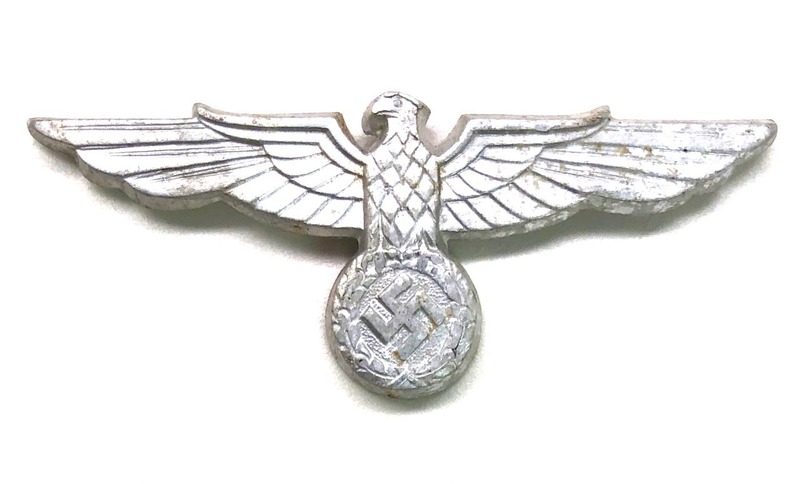 PHYSICAL DESCRIPTION: This Reichsbahn - Reichspost Visor Cap Eagle is in real nice condition. 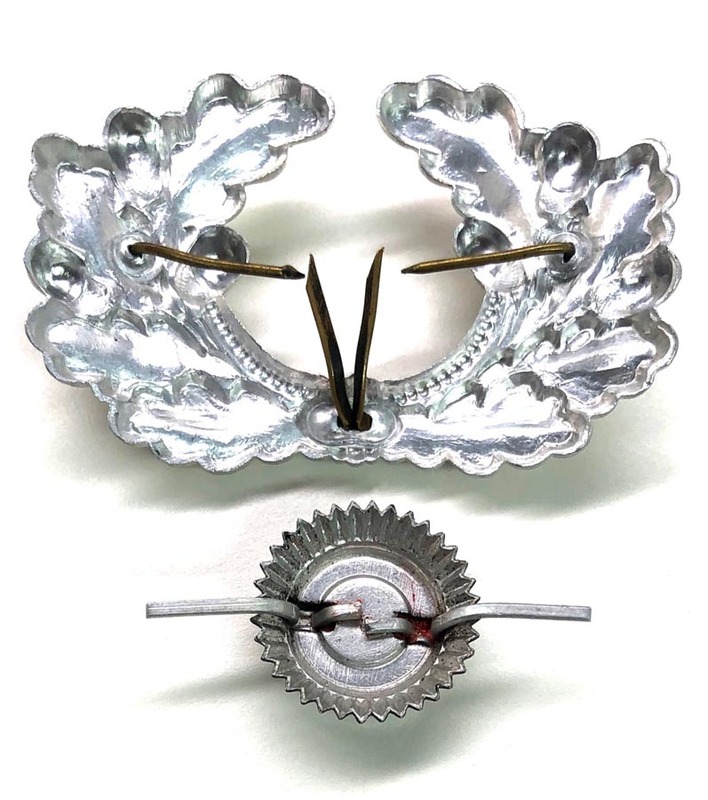 Both fastening prongs are present. 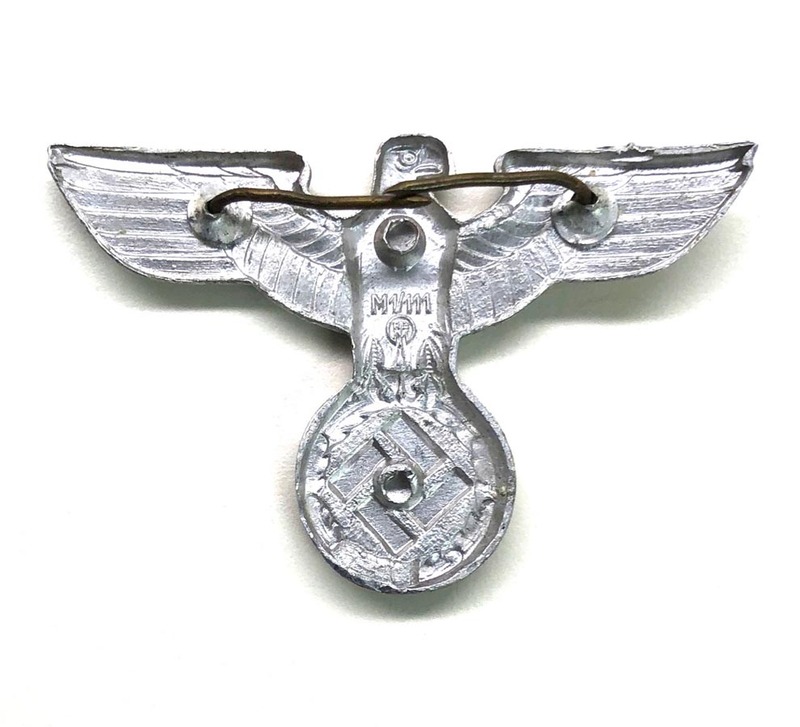 Eagle is RZM M1/111 marked for the firm of Gebruder Gloerfeld Metallwarenfabrik KG of Ludenscheid. 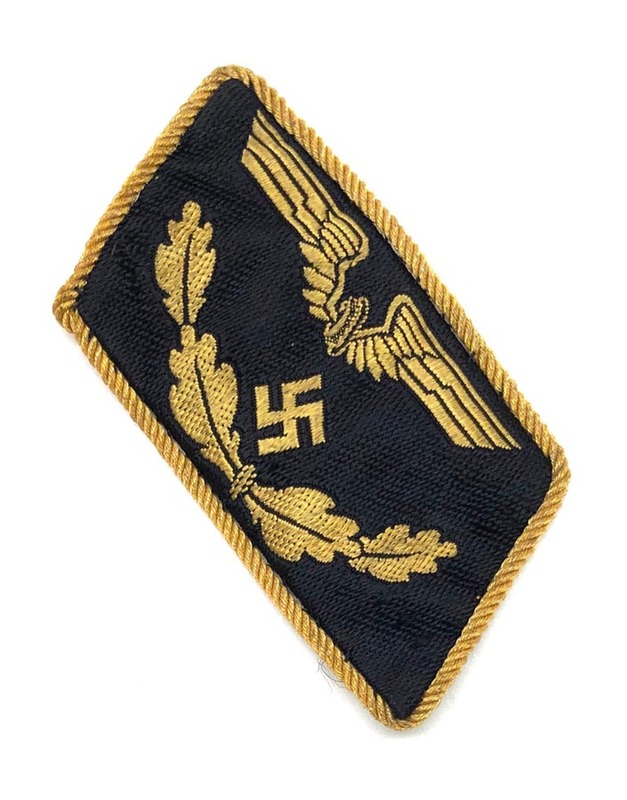 PHYSICAL DESCRIPTION: These Feuerschutzpolizei Feuerwehren Zugführer Shoulder Boards are in real nice condition showing some light mothing to backside. 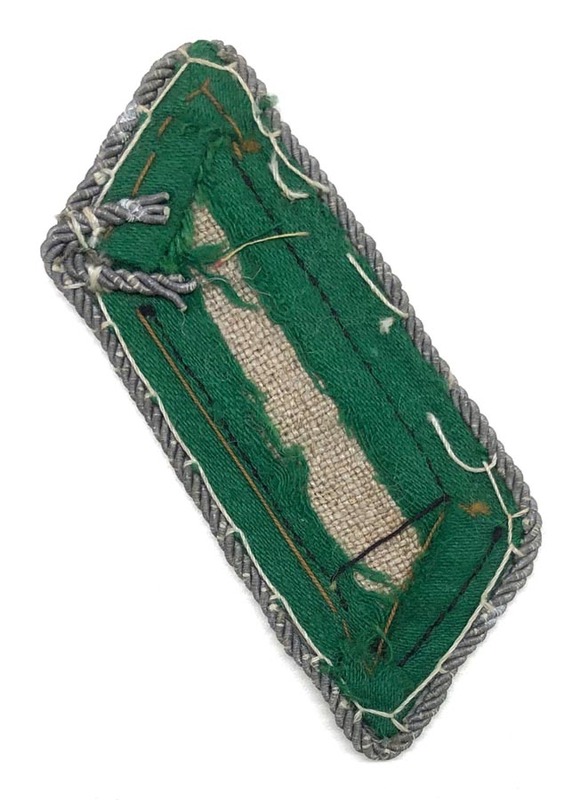 Boards appear to be unissued. 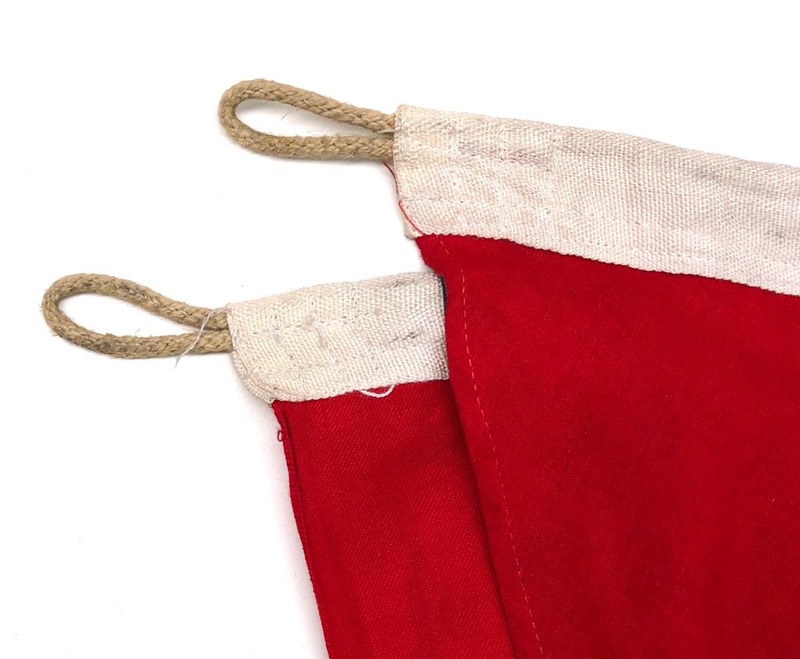 Nice matching scarce set. 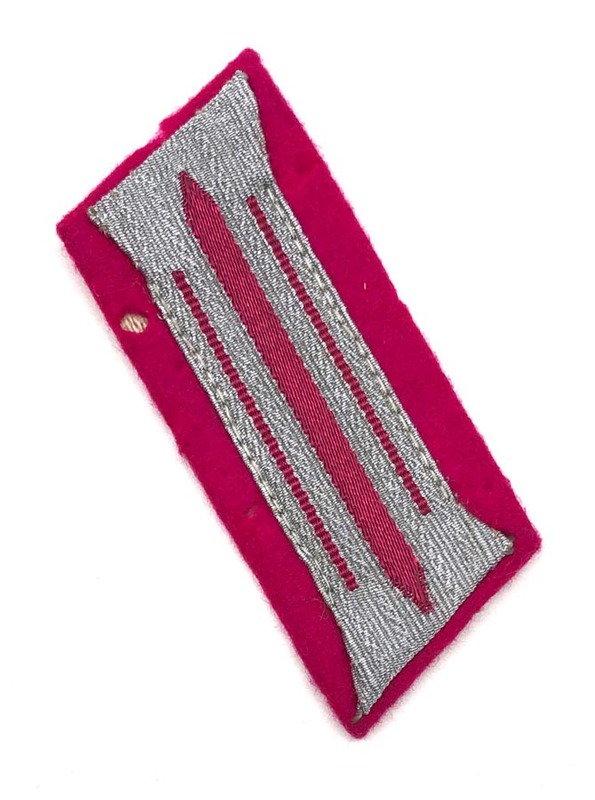 PHYSICAL DESCRIPTION: This Deutsche Reichsbahn Official's Collar Tab is in real nice condition. 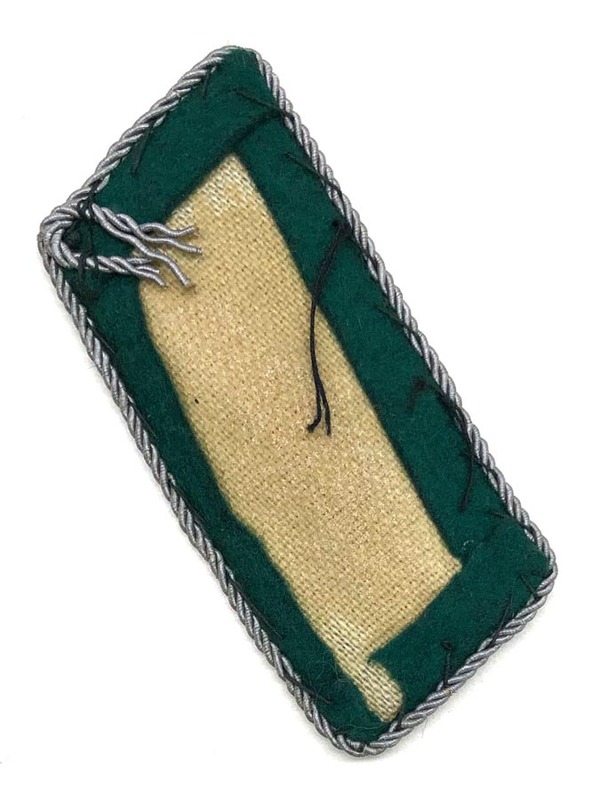 Tab is bevo weave with buckram backing. 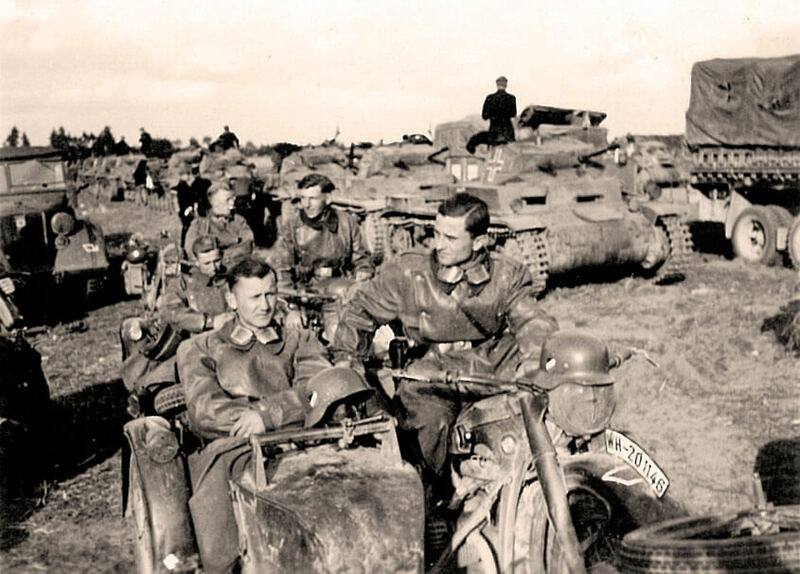 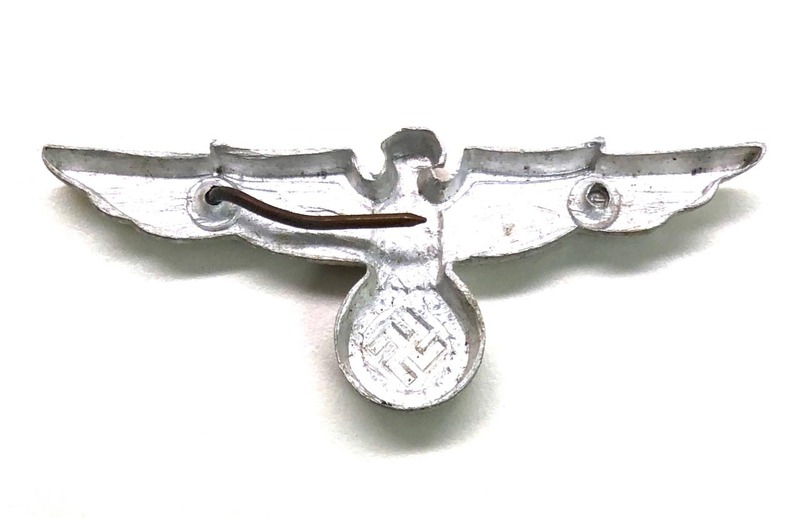 PHYSICAL DESCRIPTION: This Hermann Goring Division Panzer EM/NCO's Cap Eagle is in real nice condition. 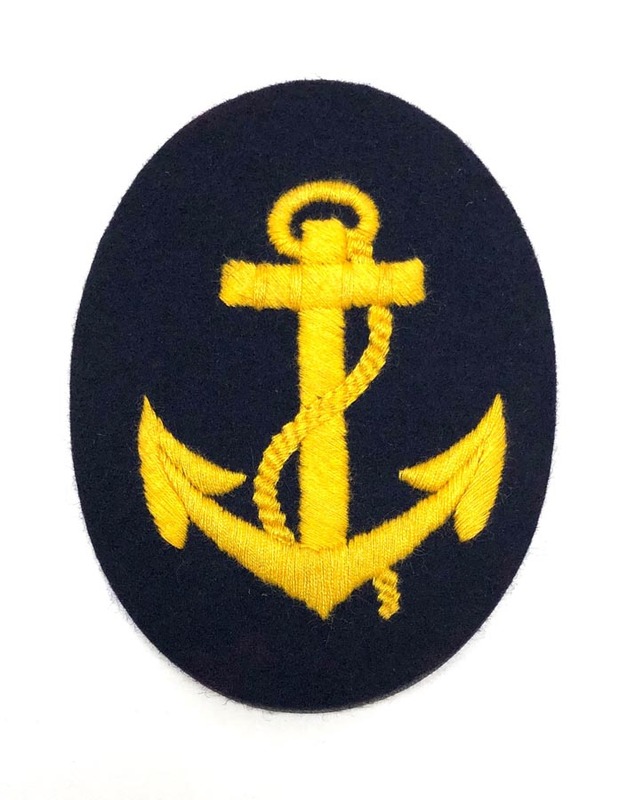 Full embroidered version used on the M43 and overseas cap. 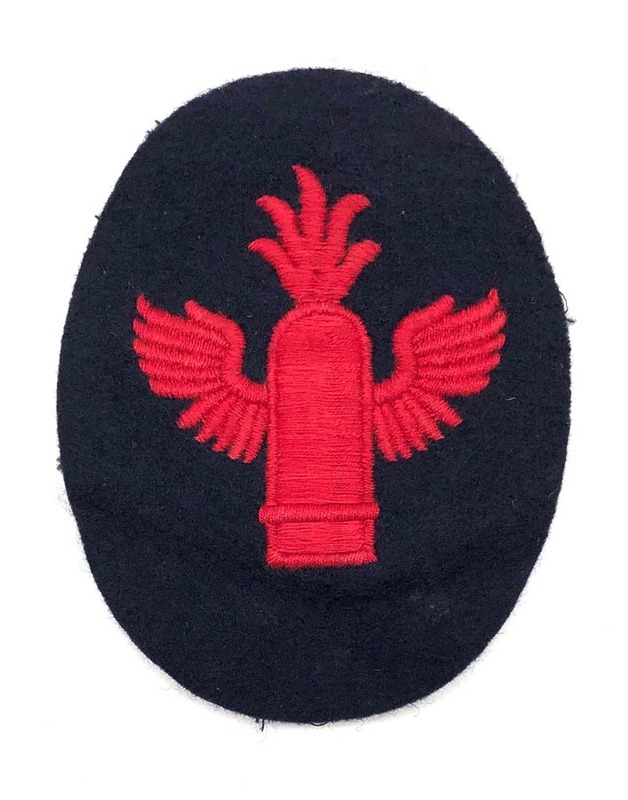 PHYSICAL DESCRIPTION: This Coastal Artillery EM/NCO's Overseas/M43 Cap Eagle is in fair condition. 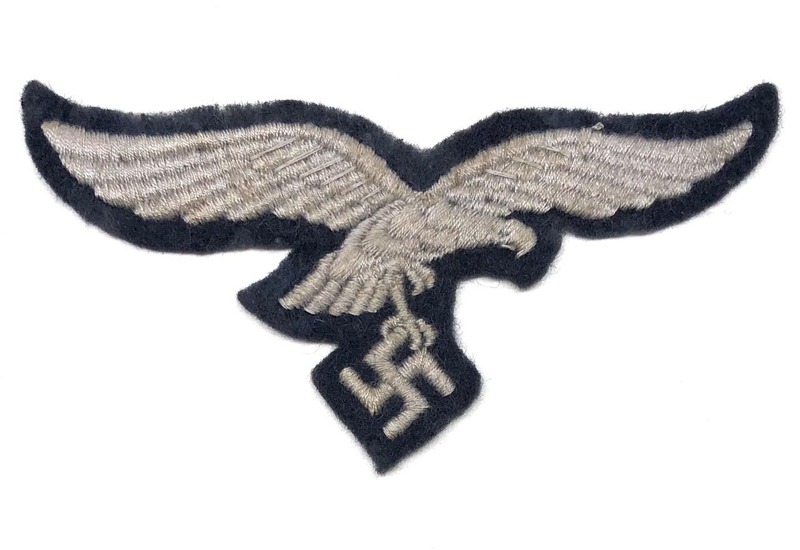 Eagle has been trimmed and there is some glue residue to backside from being in a scrapbook. 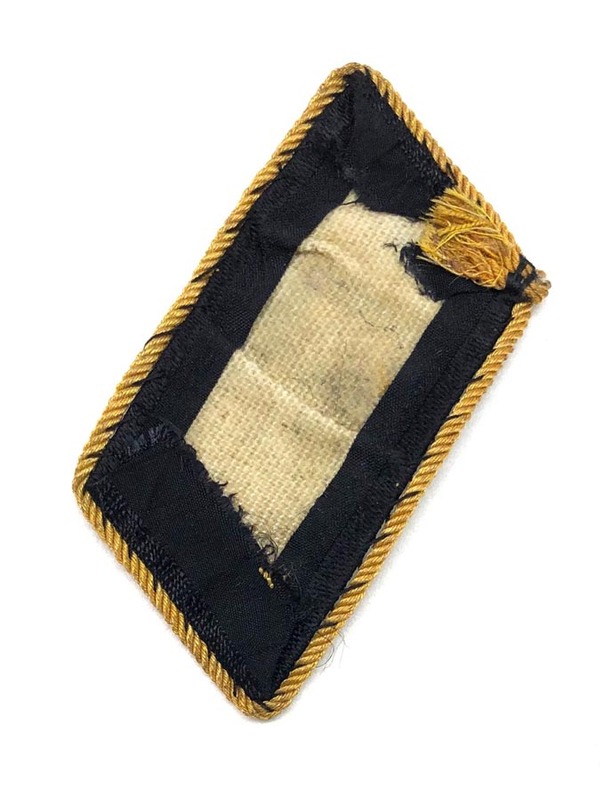 PHYSICAL DESCRIPTION: This Feuerschutzpolizei Oberwachtmeister Shoulder Board is in nice condition. 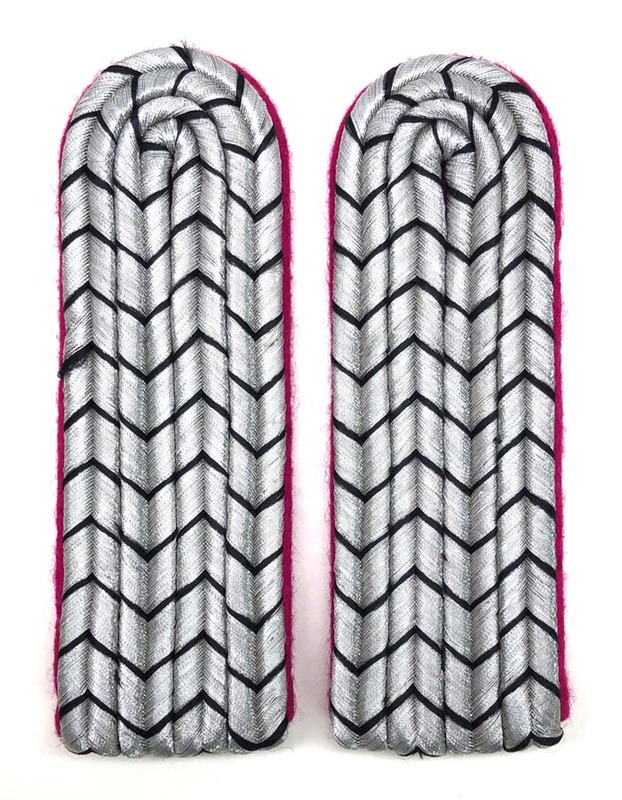 Early style board. 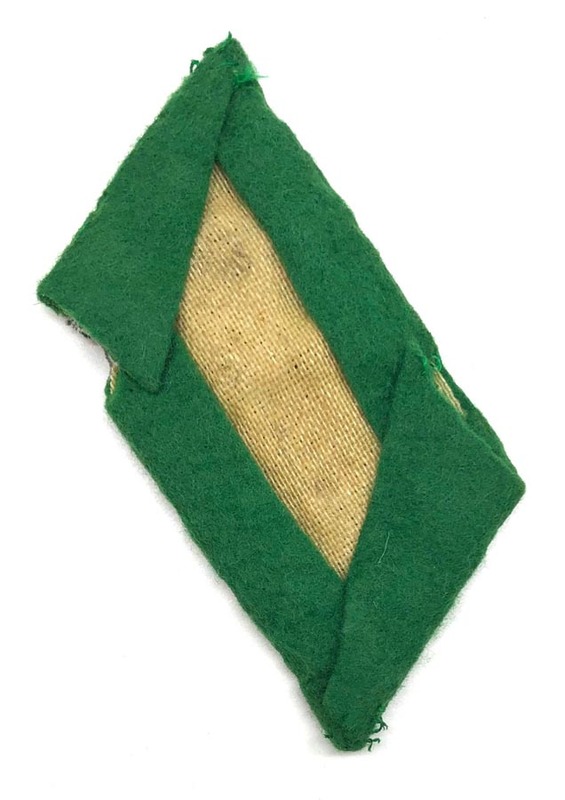 PHYSICAL DESCRIPTION: This Feuerschutzpolizei Collar Tab is in nice condition showing some mothing. 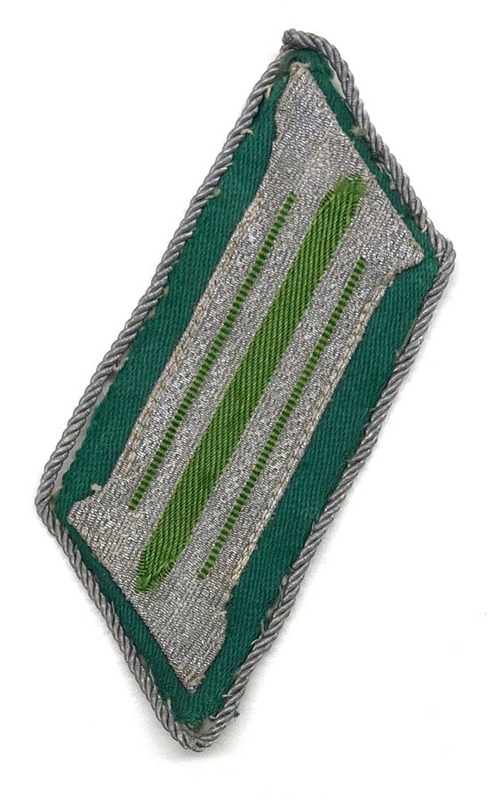 PHYSICAL DESCRIPTION: This Feuerschutzpolizei Shoulder Board is in nice condition showing some age and wear. 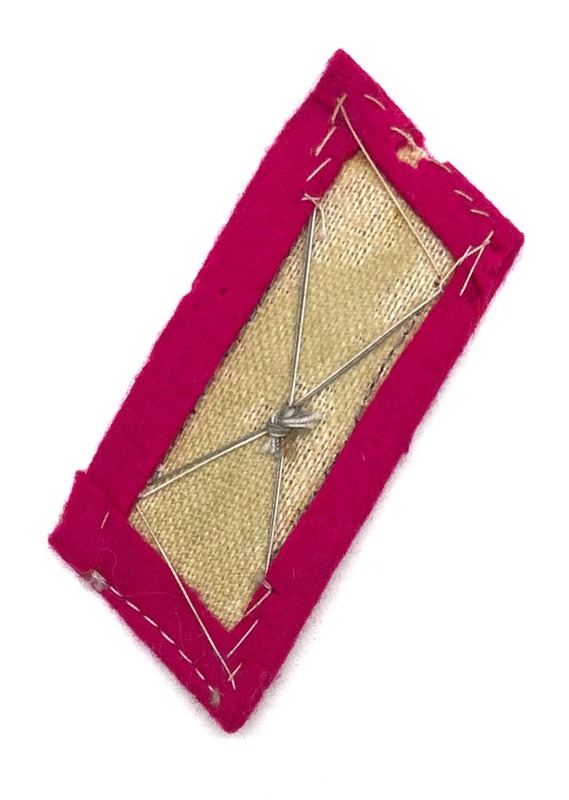 Board has some light mothing to backside. 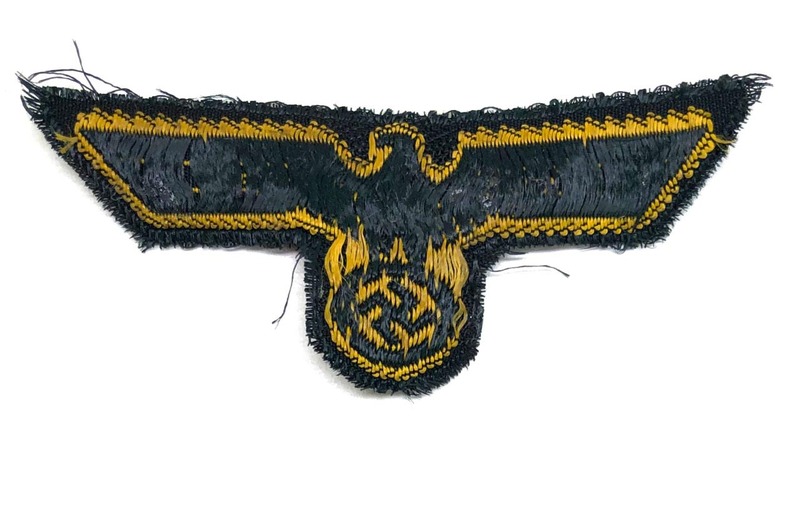 PHYSICAL DESCRIPTION: This WW2 German Schutzmannschaft Auxiliary Police collar Tab is in nice condition showing some wear. 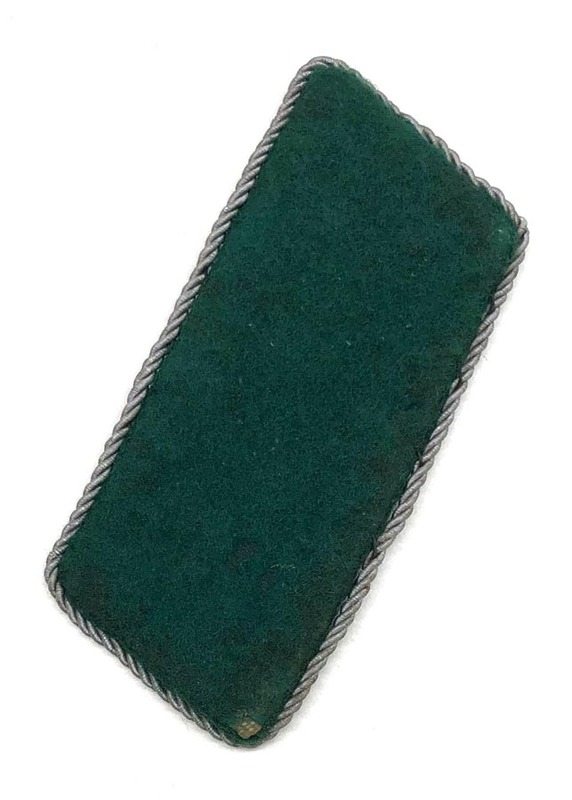 Tab is green wool with silver twisted cord and a buckram backing. 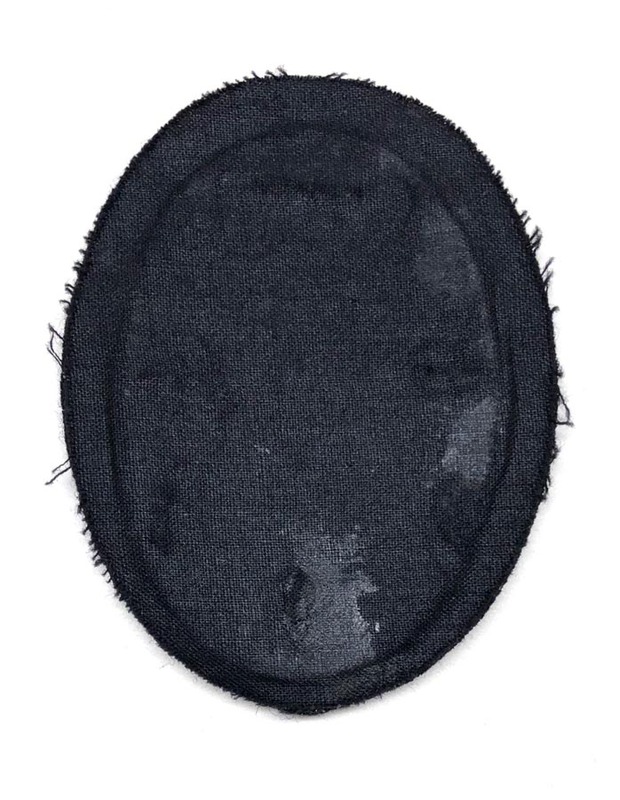 One moth hole to backside. 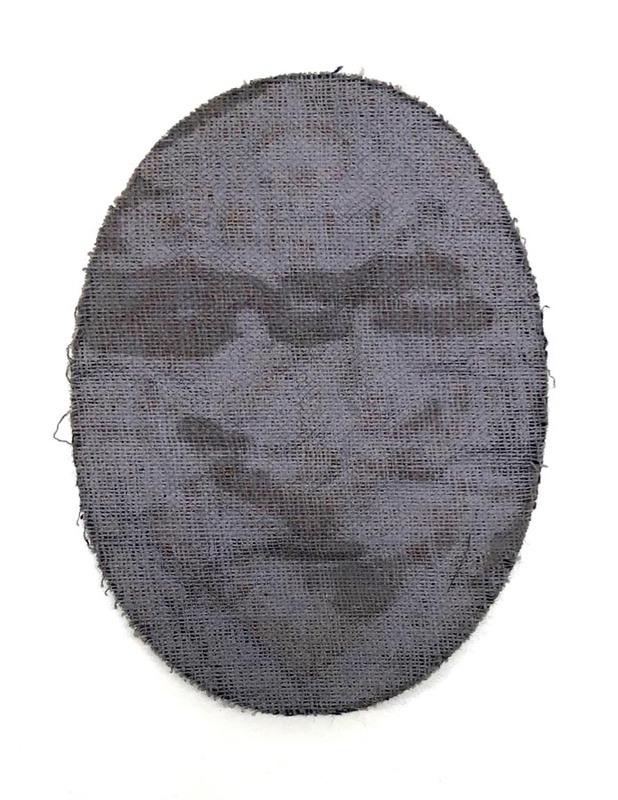 Scarce tab. 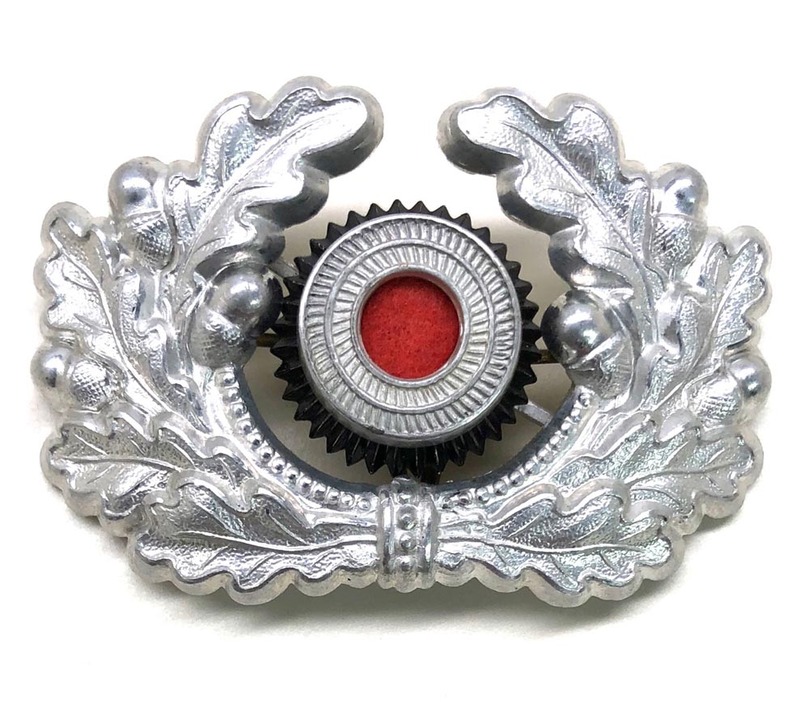 PHYSICAL DESCRIPTION: This Heer EM/NCO's Visor cap Wreath & Cockade are in real nice condition. 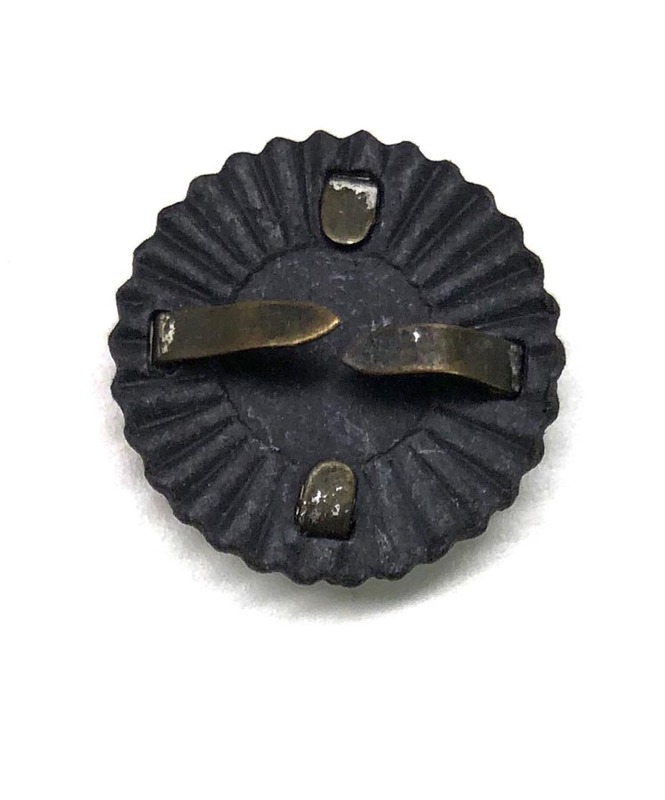 All fastening prongs are present. 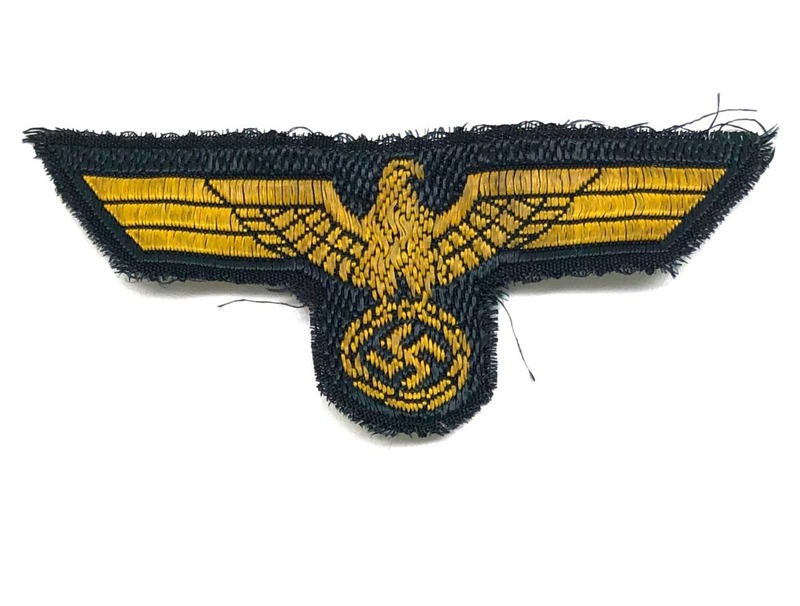 PHYSICAL DESCRIPTION: This Kriegsmarine EM/NCO's Breast Eagle is in excellent unissued condition. 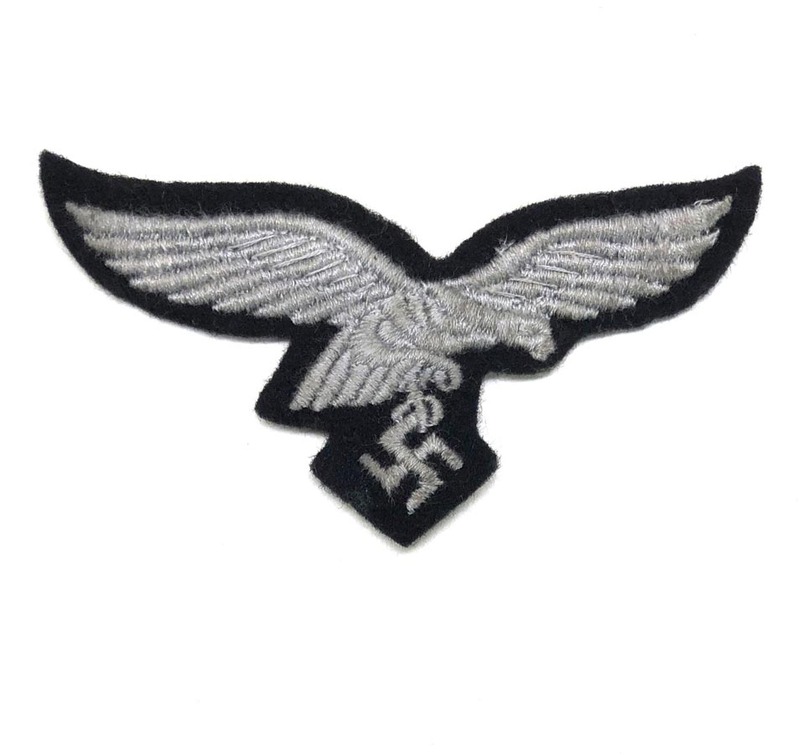 Eagle is full embroidered with a cheesecloth black backing. 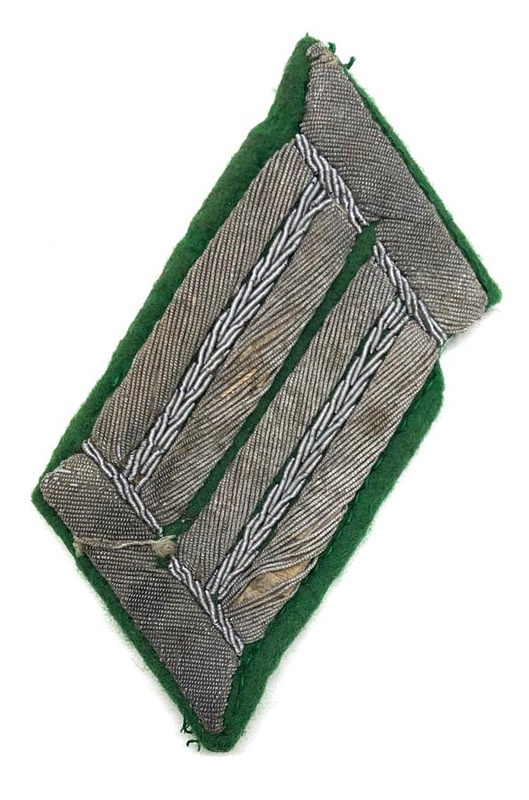 PHYSICAL DESCRIPTION: This German Police NCO's Collar tab is in nice condition showing some light wear and age. 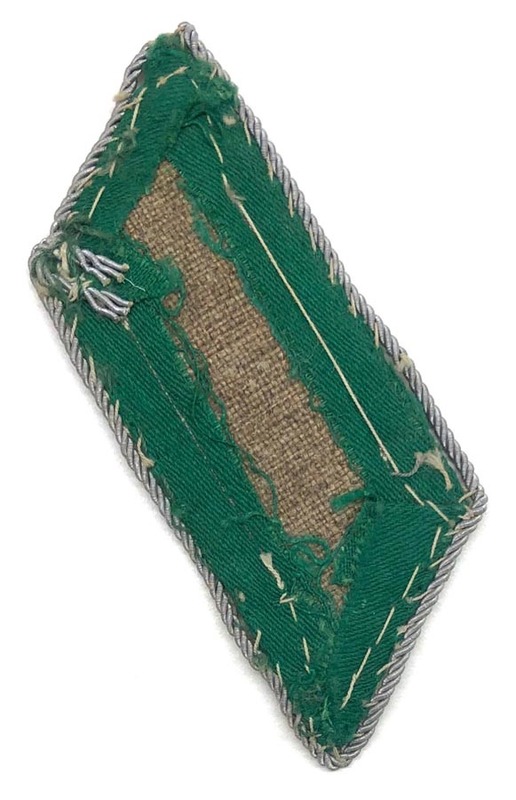 PHYSICAL DESCRIPTION: This German Police Officers Collar Tab is in fair condition showing some moth damage. 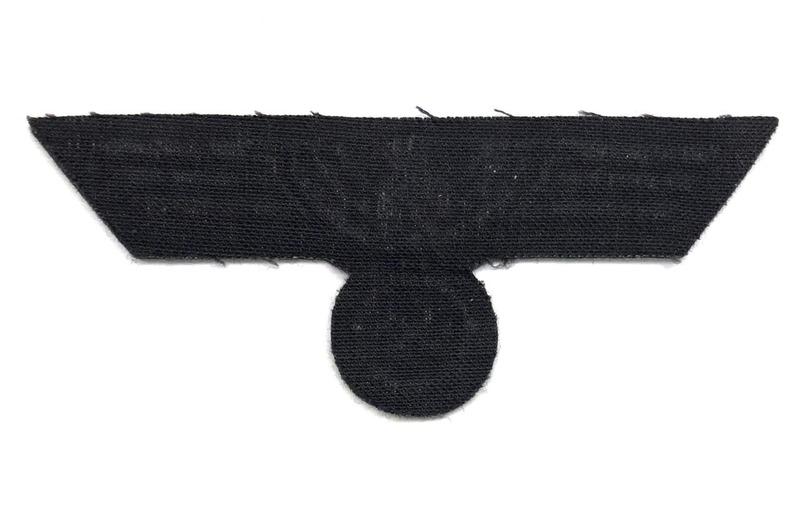 PHYSICAL DESCRIPTION: This German Police NCO's collar Tab is in nice condition showing some light wear. 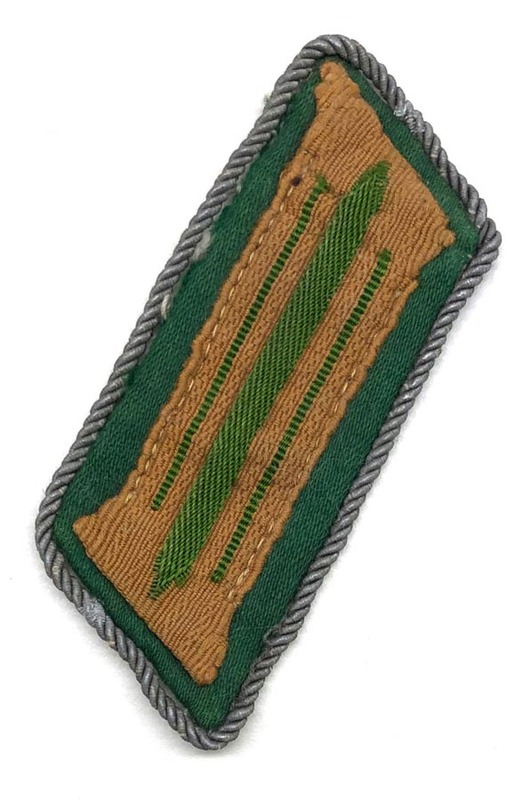 Not really sure why the litzen is in a khaki color, tropical ? 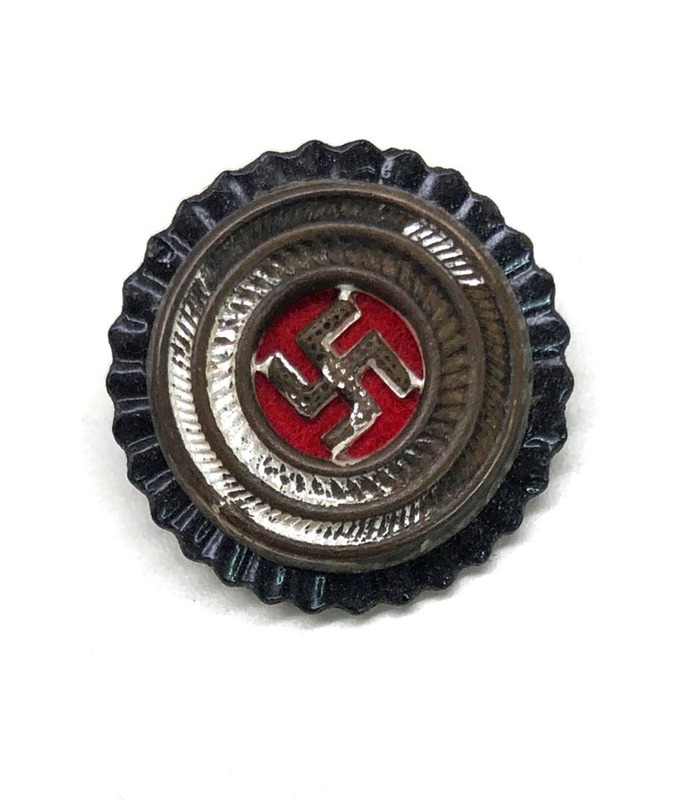 PHYSICAL DESCRIPTION: This Early NSDAP Political Leader Visor Cap Cockade is in nice condition showing some wear to finish. 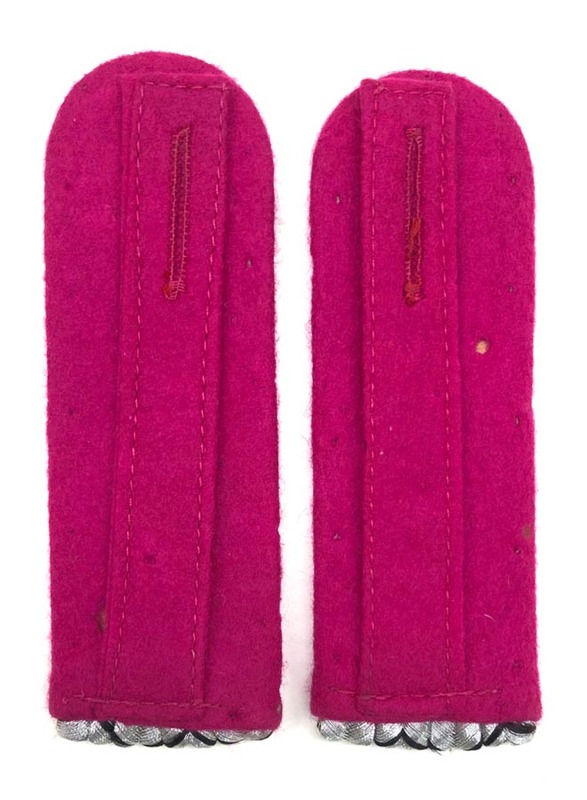 Both attachment prongs are present. 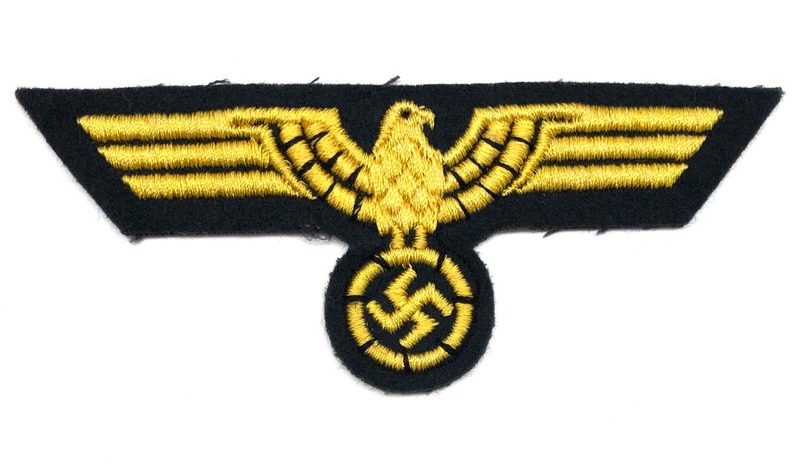 PHYSICAL DESCRIPTION: This Bahnschutzpolizei Visor Cap Eagle is in fair condition. 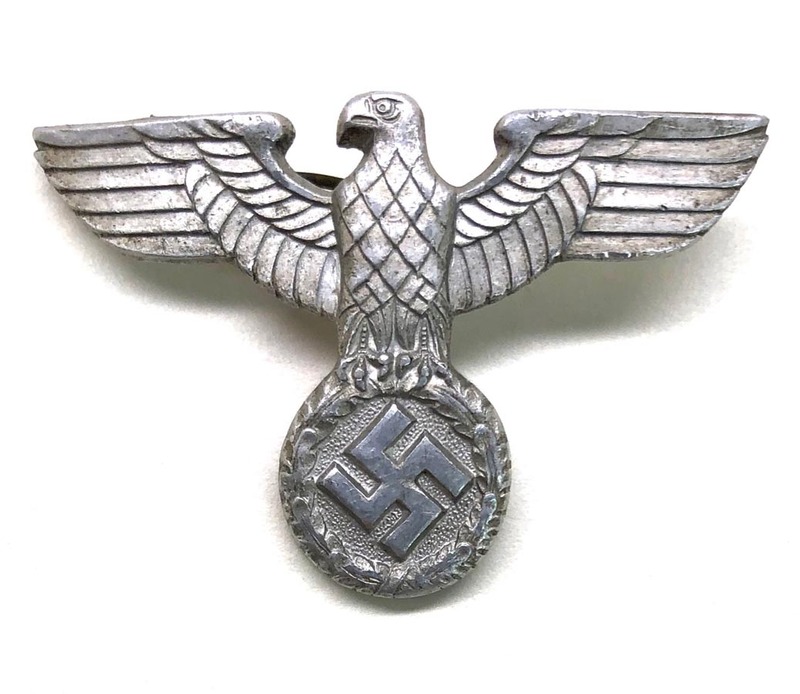 Eagle is missing one attachment prong. 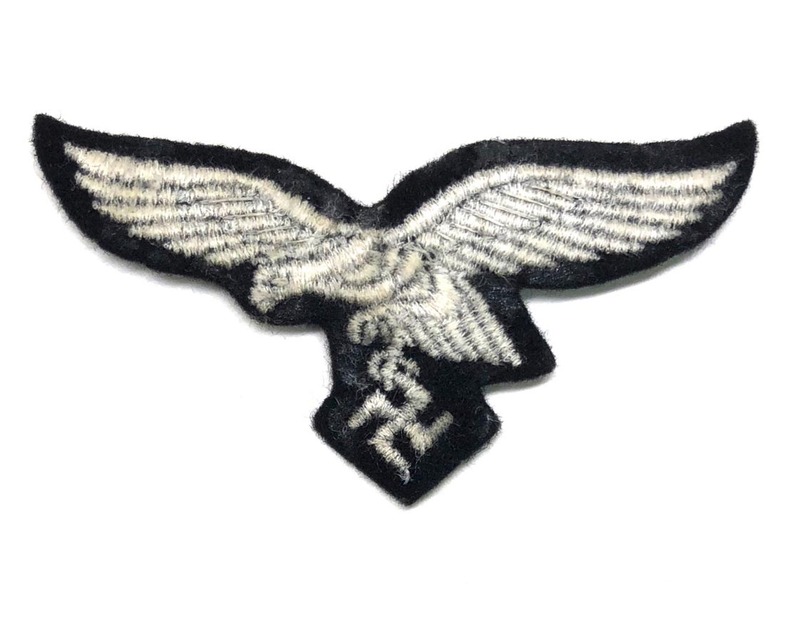 PHYSICAL DESCRIPTION: This Luftwaffe EM/NCO's Breast Eagle is in nice condition showing some light moth nips to edging. 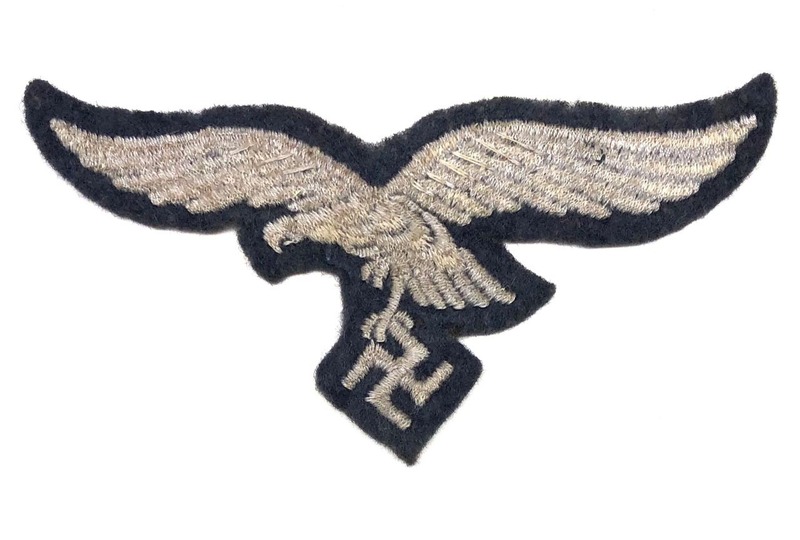 Eagle is embroidered on a felt. 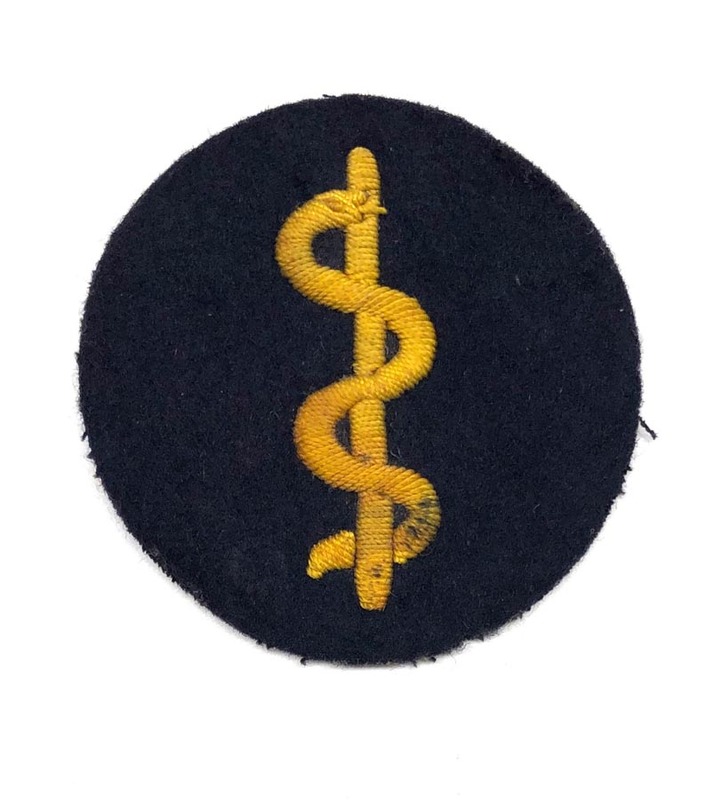 PHYSICAL DESCRIPTION: This Kriegsmarine Medical EM Sleeve insignia is in nice condition showing some light soiling but no mothing or damage. 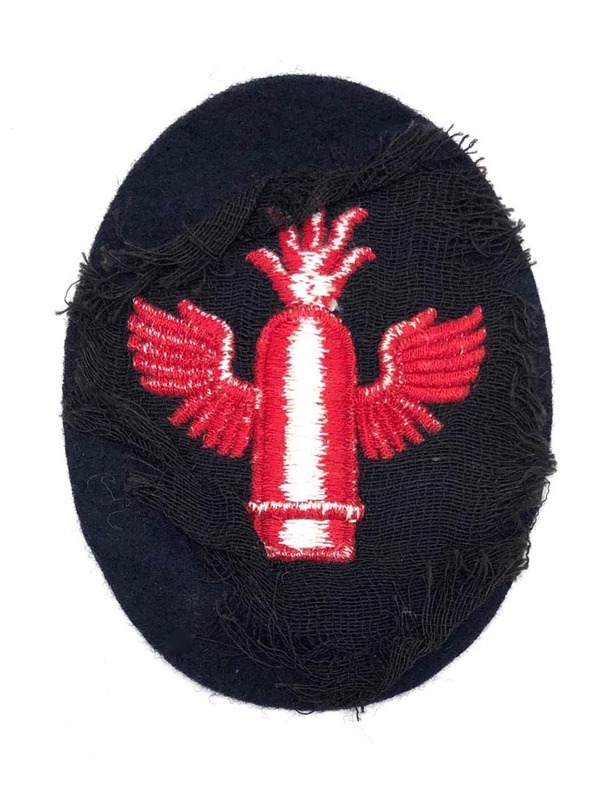 PHYSICAL DESCRIPTION: This Kriegsmarine Gunner-Observer of Automatic Anti-aircraft Trade badge is in nice condition with no damage. 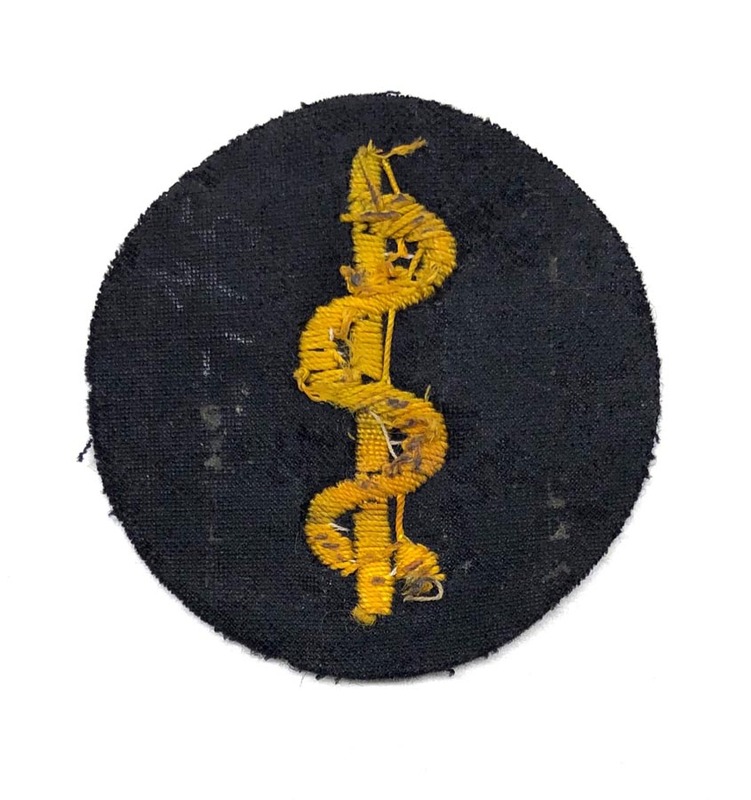 PHYSICAL DESCRIPTION: This Kriegsmarine Senior Aircraft Warning Service NCO's Sleeve Insignia is in nice condition showing some oxidation. insignia has a metal back plate covered in cloth. 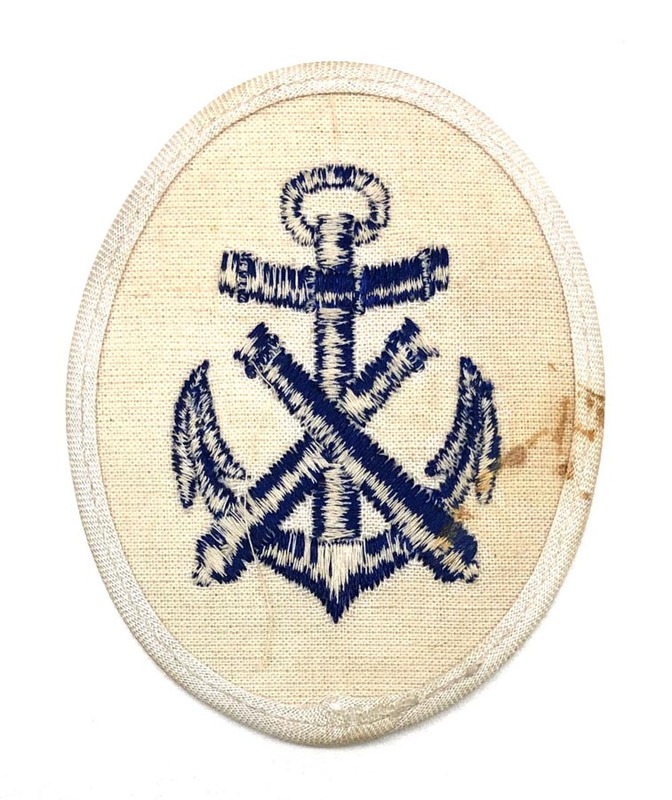 PHYSICAL DESCRIPTION: This Kriegsmarine Senior Signals NCO's Career Sleeve Insignia is in excellent condition. 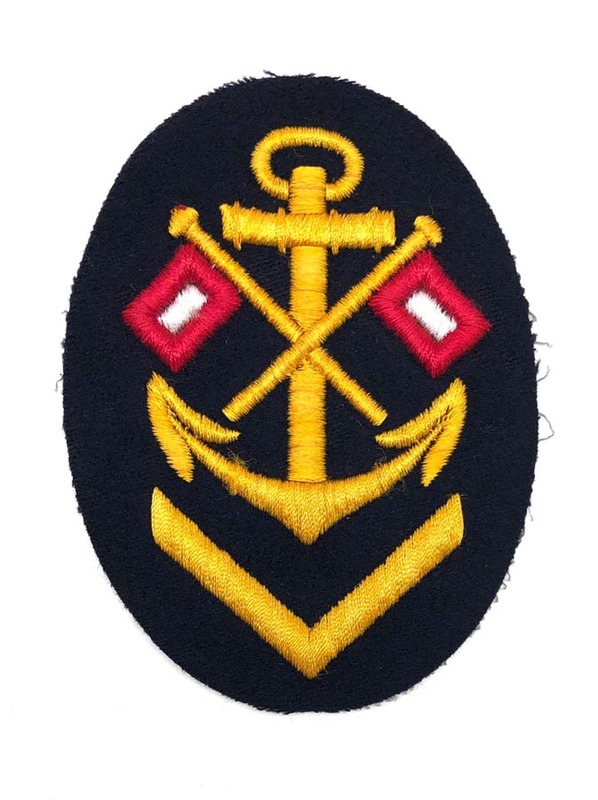 PHYSICAL DESCRIPTION: This Kriegsmarine Boatswain NCO's Career Sleeve Insignia is in excellent condition with no damage. 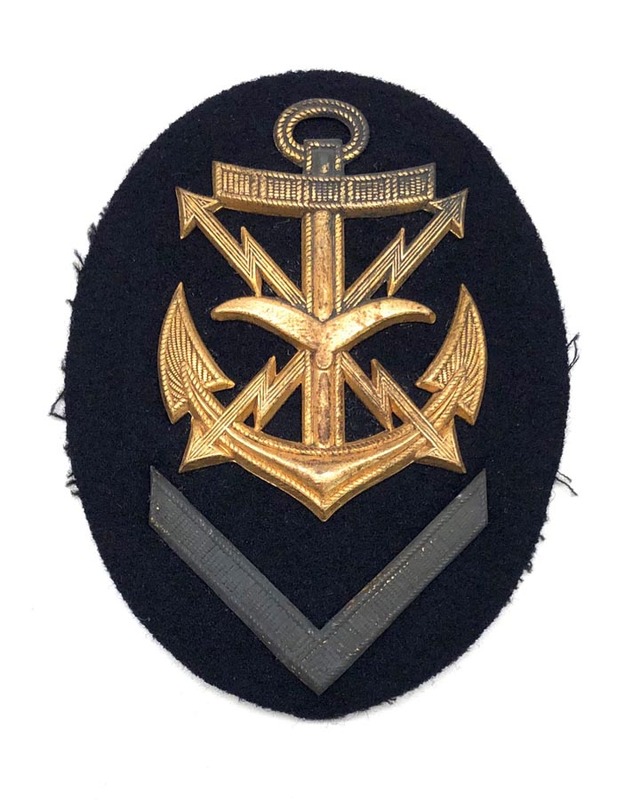 PHYSICAL DESCRIPTION: This Kriegsmarine Ordnance NCO's Career Sleeve insignia is in real nice condition with no damage.